What is the difference between a condo and a TIC? The most important difference between condos and TICs is the availability and quality of financing. Has your Realtor ever referred to an area or neighborhood by a certain District number? If so, here is a cheat sheet for you, to sharpen your skill as a buyer or seller. A condominium consists of an individually-owned “Unit” and a share of group-owned “Common Area”. The “Unit” is the space within the walls, floors and ceilings of a dwelling, and the “Common Area” is the remainder of the property. Owners pay their own mortgages, property taxes, and utilities, plus monthly “Homeowners’ Association Dues” to cover repair and insurance of the Common Area. A lengthy document called the “Covenants, Conditions and Restrictions” or “CC&Rs” establishes the rights and duties of the condominium owners. What properties qualify for conversion? Buildings with more than six residential units are not eligible for conversion. Buildings with 2-4 residential units may qualify for conversion three ways: (i) automatic (lottery bypass) qualification for two-unit buildings where each unit is owner-occupied be a separate owner; (ii) the “Expedited Conversion Program”, created June 11, 2013, under which buildings owned as a TIC as of April 15, 2013, may convert between 2013 and 2020; and (iii) the annual conversion lottery, which has been suspended but is expected to return beginning in 2024. Buildings with 5-6 residential units are also eligible for the Expedited Conversion Program, but are no longer eligible to participate in the conversion lottery. This means that 5-6 unit buildings that were not already TICs as of April 2013 cannot be converted to condominiums. Can eviction history disqualify buildings from being converted to condominiums? A building’s eviction history may disqualify or delay its conversion. The specific rules relating to eviction history are complex, and depend on who was evicted, the legal basis for eviction, when the eviction occurred, whether the tenant re-occupied after eviction, and which conversion eligibility program the building wishes to use. For detailed information on how past evictions effect eligibility for condominium conversion, see the article entitled The Effect of Eviction History on San Francisco Condominium Conversion Eligibility. Can a past “tenant buyout” disqualify buildings from being converted to condominiums? Under a recently enacted law, a tenant buyout can also affect a building’s eligibility for condominium conversion. A “tenant buyout” occurs when a tenant agrees to leave voluntarily in exchange for money or other consideration from a building owner. Effective March 2015, all tenant buyouts must be reported to the San Francisco Rent Board, and meet certain other requirements. Any tenant buyout that occurs after October 31, 2014 can disqualify a building from conversion, or delay conversion eligibility. If the buyout involved an elderly (over 60) or disabled person who has resided in the building for 10 years), or if the buyout involved a or catastrophically ill person (regardless of residency duration), the building is disqualified under all conversion eligibility programs. If the buyout involves two or more tenants, none of whom satisfy the “protected” criteria described in the preceding sentence, then the normal owner-occupancy duration requirement under all conversion programs is extended to 10 years. The new law is not clear as to whether the 10 year occupancy requirement applies when two tenants vacate the same unit, or only when tenants vacate two different units; however, we expect the latter interpretation to apply. How do two-unit buildings bypass the condominium lottery? Two unit buildings with a clean eviction/tenant buyout history bypass the conversion lottery if both units are occupied for one year by separate (unmarried) individuals who each own at least a 25% interest in the property during the entire occupancy period. This exemption from the lottery is also applicable to mixed use buildings having no more than two residential units, both of which are owner occupied. Occupancy is proven by sworn statement. Vacant apartments do not count as owner-occupied. A two-unit building cannot bypass the lottery if an elderly (over 60 who has resided in the building for 10 years), disabled or catastrophically ill person was evicted from the building after November 16, 2004. Two-unit bypass conversion is also impossible if, after October 31, 2014, there was a buyout of an elderly (over 60) or disabled person, who has resided in the building for 10 years), or a catastrophically ill person (regardless of residency duration). A building from which two or more tenants (regardless of age or disability) were evicted from separate units for any reason unrelated to the tenants’ behavior after May 1, 2005 can be converted only after 10 years of owner-occupancy unless each unit was occupied by a separate owner on April 4, 2006. A building from which two or more tenants were paid to vacate after October 31, 2014 similarly must be owner-occupied for 10 years. How does San Francisco’s new “Expedited Conversion Program” work? In June 2013, San Francisco created a new condo conversion program under which 3-6 units buildings can bypass the conversion lottery. The new condo lottery bypass conversion is open to buildings owned as a TIC as of April 15, 2013. These buildings may convert between 2013 and 2020, provided they satisfy owner-occupancy and eviction/tenant buyout history requirements. The eligibility requirements for each year of the program are described in the article entitled New TIC Condo Conversion Law. What are the owner-occupancy requirements under the Expedited Conversion Program? For 2-4 unit buildings, at least one unit must be occupied continuously for the required owner-occupancy period by an owner of record that uses the unit as his/her principal residence. For 5-6 unit buildings, at least three units must be occupied continuously for the required owner-occupancy period by separate owners of record, each of whom uses his/her unit as his/her principal residence. The required owner-occupancy period is six years. Note that these owner-occupancy periods can be extended as the result of the building’s eviction/tenant buyout history. The text of the law seems to state that the identity of the owner occupying a particular unit can change over the course of the occupancy period so long as the owner claiming occupancy at the time of filing the conversion application has lived in his/her unit for at least one year. So, for example, if John Smith, who occupies Apartment 301, sells his TIC interest to Jane Doe in Year 3 and she moves in and stays there through the rest of the occupancy period, Unit 301 will satisfy the continuous owner-occupancy requirement. However, in June 2015 DPW stated in a letter that its interpretation of the law would allow such a changeover in only one instance per building. We sent a responsive letter, and filed an appeal, and DPW then allowed an application to be processed with multiple owner-occupancy changes. Please contact us for the latest information on this issue. Note also that when a rental tenant purchases, he/she is considered an owner-occupant from the date he/she moved in as a renter. What are the “Impact Fees” that must be paid for conversion under the Expedited Conversion Program? Owners will pay an impact fee ranging from $4,000 per unit (if the building has entered and lost five or more condo lotteries) to $20,000 per unit (if the building has never participated in the condo lottery). Ten percent of the impact fee will be refunded for each unit in which a rental tenant accepts a lifetime lease. The impact fee is in addition to the normal conversion application fees discussed below. Which buildings can enter the condominium conversion lottery? San Francisco’s condominium conversion lottery has been suspended. The lottery will resume in 2024, 2025 or 2026. The exact length of the suspension will depend on how many buildings convert under the Expedited Conversion Program and how many new units are constructed with the money generated through impact fees. When the lottery returns, it will be open to 2-4 unit buildings in which all but one of the units have been owner-occupied continuously by the same owner for at least three years. Each qualifying owner-occupant need only be an owner at the time the building enters the lottery; he/she could have been a rental tenant in the building for the previous three years. Occupancy is proven by sworn statement. The three-year period is measured backwards from the lottery entry deadline. So to qualify in 2024, the required number of owners would need to have occupied continuously since January 2021. Note that the owner-occupancy period can be extended as the result of the building’s eviction/tenant buyout history. How does the condo conversion lottery work? The condominium lottery is held annually during the first quarter of the calendar year. Tickets cost $250 and are available for a two-month period ending about two weeks before the drawing. Up to 200 units may be converted through the lottery each year. Note that the lottery selects 200 units, not 200 buildings. The actual number of buildings that convert to condominiums annually through the lottery system is only 50-60, depending on the total number of dwellings in the winning buildings. The lottery system is designed to favor buildings that have previously lost. To create this preference, the lottery drawing is divided into two parts, each of which selects 25-30 winning buildings that, collectively, comprise 100 dwelling units. The first part of the selection process, called “Pool A”, selects winners from among applicant buildings that have lost the lottery at least three times, and is designed to guarantee that a building that continues to participate will eventually be guaranteed to win. The second part of the selection process, called “Pool B”, is open to all applicants and operates by random selection. The overall idea is that your chances of winning will increase each time you enter, but this goal had been undermined in recent years by the rapid increase in the number of buildings entering the lottery. Pool A buildings are grouped according to the number of years they have entered and the continuity of ownership during the period of entry and loss (as discussed in the next section). Buildings that have previously entered and lost seven times are considered “Class 8”, buildings that have entered and lost six times are considered “Class 7”, and so forth. If the number of units in the most senior Class is less than 100, all of the buildings in that Class automatically qualify for conversion. The unused Pool A places are then available for the next most senior Class. For example, if the total number of units in the senior Class is 32, 68 places will be available for the next Class. When the number of units in a particular Class exceeds the number of places remaining in Pool A, a lottery drawing will select the winning buildings from that Class. Buildings that do not qualify for, or are unsuccessful in, Pool A, are eligible to participate in Pool B. Each Pool B entrant gets a number of tickets equal to the number of times it has participated in the condominium lottery, provided there has been a continuity of ownership during the period of entry and loss (as discussed in the next section). For example, a first-time lottery entrant gets one Pool B ticket while a fifth-time entrant (with continuity of ownership) gets five. How does continuity of ownership affect lottery priority? A building gets credit for past lottery participation based upon the number of years that its most junior current qualifying owner could have participated in the lottery. This means that in a four-unit building, where three qualifying owner-occupants will be required, lottery priority will be determined based upon the duration of the occupancy of the owner that moved in the latest. If the building had lost the lottery seven times, but currently has only two owner-occupants that have been in the building since it first became owner-occupied, it will not get credit for all its losses; rather, it will get credit only for those years in which the third qualifying owner-occupant had eligibility. This means that in Pool A, which requires three years of owner-occupancy plus three years of lottery losses, the building will get credit only for those losses that occurred after the most junior of the three qualifying owner-occupants had been in the building for six years. What are the odds of winning the condo conversion lottery? At the time of its suspension in 2013, the chances of winning the condominium conversion lottery were very poor. But when the lottery returns, the vast majority of buildings previously in the lottery will have been converted through the Expedited Conversion Program. Moreover, 5-6 units buildings will no longer be eligible for the condo lottery, and 3-4 units buildings will be required to have more owner-occupied units. These developments should significantly decrease the number of building participating in the lottery, and significantly increase the odds of winning. On the other hand, the 10-12 year suspension of the lottery will create a backlog of buildings waiting to convert, and this will likely mean a larger than average number of buildings will enter the lottery for the first time when it resumes. On balance, we project that the odds of winning the lottery when it comes back is likely to be better than it was at the time the lottery was suspended, but still relatively low. What rights to tenants have when their building is being converted to condos? Do tenants have a right to purchase their apartment after it is converted? Can tenants be evicted before, during or after condominium conversion? Buildings with rented units must comply with additional requirements. All renters get an opportunity to purchase after conversion. The tenant can exercise the purchase right regardless of whether the owner wants to sell, but the owner can effectively discourage purchase by setting the price as high as he/she wishes. In buildings converting under the Expedited Conversion Program, all non-purchasing renters get lifetime rent-controlled leases. In buildings converting under the lottery system, disabled and senior (over 62) renters get lifetime rent-controlled leases, and other tenants get one-year rent-controlled leases. All tenants must be notified of their rights before a lottery conversion application is filed. Contrary to popular misconception, converted units are not exempt from most rent control restrictions until they have been sold following conversion. But at the conclusion of a lease period, renters may be evicted in connection with the sale of a unit. A lifetime lease is a written contract between the owner and the tenant under which the tenant is entitled to possession of his/her apartment until he/she dies. If the tenant is living in the apartment when he/she dies, and there is surviving household member who is elderly or disabled, the lease continues until that person’s death. A lifetime lease tenant cannot be evicted except for non-payment of rent or other lease violations. This means no owner move-in, relative move-in, renovation, or Ellis Act eviction of the lifetime lease tenant by the current owners or subsequent owners. Note that unlike an ordinary rent-controlled tenant, a lifetime lease tenant does not lose his/her rights when he/she vacates the unit. The tenant can move out and still keep the apartment; but this does not necessarily mean the tenant can allow others to live there. Can a tenant waive his/her right to a lifetime lease? Can an owner pay a tenant to give up his/her lifetime lease rights? Because the lifetime lease provisions of the Expedited Conversion Program are so new, many details have not yet been clarified, particularly with respect to lifetime leases. But there is nothing in the written law that prevents a tenant from waiving his/her lifetime lease or prevents an owner from paying a tenant, or offering some other concession or benefit, in exchange for the tenant giving up his/her life lease. Keep in mind that there is a difference between paying a tenant to move out and paying a tenant to waive his/her lifetime lease. Paying a tenant to move out is clearly a violation of the rent control law, and an agreement by a tenant to move out in exchange for money is therefor unenforceable. But paying a tenant to give up a lifetime lease, while continuing to live in his/her apartment as a “normal” rent control tenant, does not seem to be illegal, at least under the written law of the Expedited Conversion Program. Since the City will be recording lifetime lease documents against the building even if the tenant has agreed to waive his/her lifetime lease rights, the paperwork used for such a tenant buyout must be prepared carefully to ensure that the condo can be sold for its full value and that a lender will provide a mortgage based on that full value. Could a lifetime lease tenant assign or sublease the apartment? Could the tenant move out and still collect rent from the apartment? The law does not contain details on the ability of a lifetime lease tenant to assign or sublease his/her apartment, and the courts will ultimately have to resolve the issue. The most likely interpretation is that the assignment/subletting restrictions in a particular tenant’s lifetime lease will be the same as those that apply to his/her previous tenancy. For example, if the tenant’s existing tenancy is subject to a legally enforceable absolute ban on assignment/subletting, that ban can also be placed in his/her lifetime lease. Note, however, that, under the SF Rent Board Regulations, such bans are only enforceable if they meet certain very specific requirements, and even then do not apply when an original tenant is replacing a departing co-occupant with a new occupant. This may mean that, regardless of what the lease states, lifetime lease tenants can assign/sublease so long as at least one of the tenants named on the lifetime lease continues to reside in the unit. To make matters worse, it has been very difficult for owners to successfully evict occupants based on the fact that the last “original tenant” has vacated, because the tenant often claims that he/she is still living in the unit or is just away temporarily. Owners should expect this problem to continue, or even worsen, in the context of a lifetime lease tenant who is living elsewhere while still claiming to occupy the owner’s condominium. A related question is whether a lifetime lease tenant can continue to pay his/her low rent to the condo owner while charging a higher amount to the “subtenants” or “roommates” living in the lifetime lease unit. SF rent control law prohibits this by requiring rent-control tenants to charge subtenants/roommates no more than a pro rata share of what the tenant is paying to the owner. This same limitation can probably be included in the lifetime lease; however, in practice, it is close to impossible for an owner to know or prove how much the subtenant/roommate is actually paying the original tenant. What building code requirements apply to condo conversion? Must the building be brought up to code to convert? Converting buildings need not meet current building codes, be seismically upgraded, or have parking. But the City does require a building inspection. The inspection process has six steps: (i) submittal of the inspection request form and fee, (ii) a site visit by City building, plumbing and electrical inspectors, (iii) issuance of a written inspection report, (iv) receipt of a building permit for corrective work, (v) completion of all required work, and (vi) City inspection of the work and issuance of a completion certificate known as a “CFCO”. Recently, there has been a delay in obtaining inspections. For two-unit buildings bypassing the lottery, applying for an inspection several months before the one-year occupancy requirement is reached can expedite the conversion. Note that once a City inspection is requested the cited work must be completed whether or not the conversion is pursued. Inspection reports typically cover three types of problems: (i) work which was completed without required permits (including everything from kitchen renovations to decks to in-law units), (ii) conditions which present safety hazards (like poor fire egress or dangerous electrical wiring), and (iii) energy and water conservation violations. In cases where a significant amount of work is suspected pre-inspection by a private consultant familiar with conversion requirements may be beneficial. Such a consultant can provide advance warning of likely inspection issues, recommend prophylactic measures to minimize work requirements, establish the legality of preexisting improvements, and obtain building permits. How do qualifying properties begin conversion? Inspection: Before submitting a conversion application, you must request a City inspection by mailing in a form and the required fee. The receiptfor the inspection fee is part of the conversion application,but you need not have had your inspection in order to submit the conversion application. Occupancy: Owners or renters needing to prove occupancy must sign a sworn statement. Owners must also provide evidence they have taken a homeowner’s property tax exemption. The package must also include a variety of other items which an attorney can help you compile. The application is processed by the Department of Public Works with approval required by several additional city departments. During 2012, the median length of a 2-4 unit conversion has been four months and the median length of a 5-6 unit conversion has been six months; however, we expect processing periods to at least double in 2013-2015 due to the large number of applications submitted under the Expedited Conversion Program. This timeline includes the time it takes the owners to make required building improvements. A professional with knowledge of the process and the processors, and the ability to focus on the progress of the application, can accelerate approval. What other documentation is required? Some 5-6 unit properties must also obtain a “Final Subdivision Public Report” from the California Bureau of Real Estate by submitting a separate application. Please call us for a determination of whether a particular 5-6 unit building will need this. What steps remain after an application is approved? The approved survey must have a notarized signature from all recorded owners and, in the case of 5-6 unit buildings, all lenders. It is then returned to the City with an updated title report, a certificate of completion of the inspection work, and a Tax Certificate showing property taxes are paid current. The building officially becomes condominiums when the survey and CC&Rs are recorded. Final recordation does not alter the ownership or financing of the property. All of the condominiums in the building remain owned by the same individual or group, and all remain subject to the same mortgage. Thus if two owners each own 50% of a duplex before conversion, they will each own 50% of both condominiums after conversion. Separation of the condominiums so that particular owners have title to particular units generally requires refinancing with separate mortgages for each unit. What are the costs of condo conversion? State Fees: The State application is required only for some 5-6 units, and the fee is currently about $1,700. When State approval is required, the applicant owners must also obtain a formal budget which is best prepared by a professional budget preparer at a cost of about $4,000. Surveyor: Surveys start at about $8,000 and increase with building size. Attorney: Typical attorney services include preparation of the City Application, monitoring/troubleshooting, advice on space assignment, CC&Rs, and assistance in lender signing and recordation. Repairs: Building permit fees and repair costs depend on the extent of needed work. Title: Most title companies will provide required title reports free of charge if the owner promises to use the same company for a post-conversion sale or refinance of the property. Lender: Lender charges to sign the survey range upwards from $750. Must the pre-conversion lender consent to the condominium conversion? 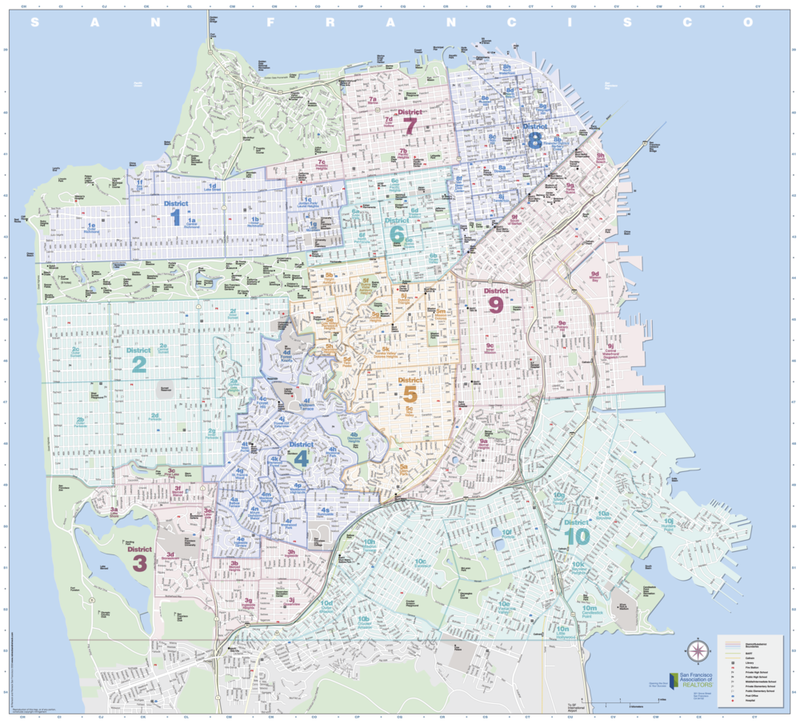 Until June 2006, the San Francisco Department of Public Works (“SFDPW”) would not record the condominium map (the event that signified completion of the condominium conversion process) unless all lenders with mortgages on the property had signed the map signifying their assent to the conversion. If a conversion applicant could not get his/her lender to sign, he/she could not complete the conversion without refinancing with another lender that would agree to sign. Often, this requirement caused delay while the refinancing occurred, and imposed significant additional costs in the form of appraisal fees, loan origination costs, and title and escrow expenses. The new loan would typically be paid off immediately after the condominium map was recorded as the owners sold or financed the condominiums. This inconvenient and expensive process was becoming more and more common as an increasing number of lenders refused to sign. SFDPW announced in June 2006 that it will no longer require the consent of a property’s existing mortgage lenders in order to allow a 2-4 unit property to be converted to condominiums. Although the new policy will allow most owners with non-compliant lenders to complete their conversion, these owners will not be able to record their covenants, conditions and restrictions (“CC&Rs”) until they are ready to sell or refinance the condominiums. California law requires that lenders sign the “condominium plan” (an attachment to the CC&Rs which shows the spaces included within each condominium) as a condition of condominium formation. As a result, where the pre-existing lender has not signed the condominium plan, title companies will require that funds from replacement loans (either refinance loans or purchase loans) be in an escrow account with the title company before the CC&Rs and condominium plan can be recorded. This requirement will impose only a minor inconvenience on condo converting owners because there is no reason to record the CC&Rs and condominium plan until the owners are ready to sell or refinance. Note that the new SFDPW policy does not apply to buildings containing more than four units. Such buildings will continue to need to obtain lender signature on their condominium maps. Do I need to refinance after conversion? Refinancing is not required by most lenders but is necessary prior to transferring any of the condominiums individually. Most owners refinance for the following reasons: (i) to allow the condominiums to be transferred to individual owners or sold separately, (ii) to eliminate the default risk associated with sharing a loan obligation with other owners, (iii) to eliminate the risk that a future job loss, illness, or credit blemish will make refinancing difficult or impossible, (iv) to qualify a unit for eventual exemption from San Francisco’s limitation on rent increases, or (v) to replace one large loan on the entire building with several smaller and lower-interest loans on individual condominiums. Will conversion increase my property tax? Conversion will not increase the assessed value of your property. The current value will be allocated among the condominiums, and each condominium will get a separate tax bill based on the allocation. Will conversion increase my insurance premiums? Conversion often increases insurance costs, particularly in 3-6 unit buildings, and you may be required to switch insurance carriers. Consulting your insurance agent early in the conversion process will help eliminate unpleasant surprises once the conversion is complete. SirkinLaw APC has been guiding clients through San Francisco condominium conversions and subdivisions for more than 20 years, and have completed more SF conversions than any other firm. Over the years, we have been involved in drafting many of the laws that govern SF condominium conversions, and have helped develop many of the procedures used by the San Francisco Department of Public Works (“DPW”) Bureau of Street Use and Mapping (“BSM”). Our breadth of experience makes it likely that if a glitch appears in the condominium conversion process, we will have seen something similar before and know exactly what to do. And for those rare occasions when a completely new issue arises, we are the recognized masters at developing creative solutions that save our clients time and money. Experience has taught us that the most important things to our clients are the immediate availability of staff to answer client questions and diligence in following the process of governmental approval. To ensure we achieve these goals, we have a full-time paralegal, Cam Perridge, devoted to client contact, preparation of subdivision applications, and monitoring subdivision approvals. Cam maintains a direct-access telephone line and can be reached easily any weekday to discuss the status of a conversion or subdivision process. And for those occasions when you need to speak with an attorney, Andy Sirkin is committed to being available to you when you call or within the next 24 hours. Andy is known for his diligence in calling clients back quickly, and is more committed than ever to being easily reached. But while processing the condominium conversion or subdivision quickly and efficiently may be our client’s most immediate priority, the governing documents (the Declaration of Covenants, Conditions and Restrictions, or “CC&Rs” supplemented in some cases by Bylaws and/or Articles) will have much greater long-term impact. The quality of the governing documents will directly affect the quality of life of the owners, as well as their ability to refinance and sell. Andy Sirkin has been co-author of the past 10 editions of The Condominium Bluebook, and his expertise in preparing condominium governing documents is recognized throughout California. SirkinLaw APC governing documents continue to be the ones other firms emulate, and Realtors, lenders and buyers strongly prefer. This leadership results from constant improvement and innovation that makes our documents easier to read and understand, as well as more efficient and less expensive to enforce. The weeks leading up to your move can be chaotic and stressful. Follow these tips to make sure you stay on track and cover all your bases as you transition to your new home. This map of San Francisco neighborhoods is according to the San Francisco Association of Realtors district and sub-district, Multiple Listing Service (MLS) specifications. Real estate values and prices, property types, age of construction, architectural styles, views, amenities, commercial districts and home sizes can vary widely between different neighborhoods. Indeed, San Francisco is more a collection of delightfully different neighborhoods than a homogenous entity. The sale of real property involves transferring large sums of money and signing important documents by you, the Seller and your lender. Real estate is an incredibly complicated business involving large sums of money. Your agent should be able to clearly explain what it is they bring to the table on your behalf. The first step to financing your home purchase begins with finding a qualified lender. If you wish, I can recommend one who has the requisite experience, competence and integrity. Not all risks can be determined by a title search, since certain things such as forgeries, identity of persons, incompetency, failure to comply with the law, or incapacity cannot be uncovered by an examination of the public records. The Preliminary Title Report is an offer to insure under certain situations; the title policy is a contract that gives coverage against such problems. Mistakes in the interpretation of wills or other legal documents. Deeds delivered without the consent of the grantor. Deeds and mortgages signed by persons not of sound mind, by minors or by someone listed as single but who is, in fact, married. A forged signature on the deed. Impersonation of the real owner. Errors in copying or indexing. The priority of the insured mortgage. The invalidity or unenforceability of the insured assignment. The invalidity or unenforceability of the lien of the insured mortgage on the title.